Test Chamber (Free) is a gift for any game reviewer. The minimalist indie puzzler sneaked on to the App Store a couple of weeks ago with very little fanfare, and went largely unnoticed. But those who did play it discovered a wonderful logic game, with a unique physics twist and some excruciatingly tough but very satisfying puzzles. And now, dear reader, I get to share it with you, and you can discover its delights for yourself. It must be the most frustrating aspect of indie game development: Producing a great title and having next-to-no budget for advertising. It doesn’t matter how good a game is, if nobody knows about it then nobody’s going to play it. Australian developers Shark Jump must be painfully aware of this. Their previous games have sunk in to such deep obscurity on the App Store that even searching for them by name returns page after page of other games. In fact, between them, Animal Dash! (Free), Flap The Fish (Free) and Do You Even Drift (Free) have amassed a total of just one App Store review. The last bastion of hope for indies is word-of-mouth recommendation. For the past week I’ve been telling anyone who will listen that they need to play Test Chamber. And judging by the 5-star reviews on the App Store and the wealth of enthusiastic praise in our forums, this could be the breakout title for developers Matt Le Krupa and Tom Lee. You guide an unnamed cube-headed hero on his quest to escape the wraparound world of the Test Chamber, hoping to reach the Infinite World, which he has heard stories of. 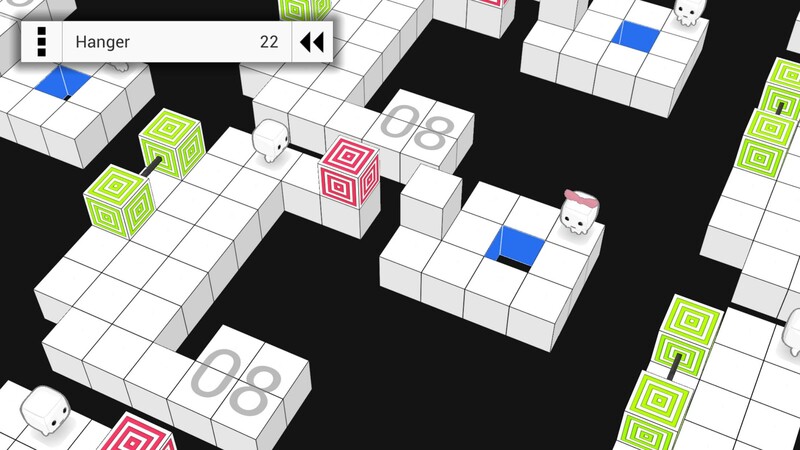 Each level takes place on a formation of blocks, with cubes that can be pushed around to bridge gaps, and you must work out how to reach a portal to the next level. Some puzzles can only be solved by clever use of the way the chambers repeat in all directions, so as you walk off the left side of the screen, you appear at the right side. Same for top and bottom. The clean, minimal graphics are accompanied by a melancholy soundtrack, and along with small snippets of pessimistic dialogue from characters that you meet on your quest, this sets a tone that is quite sombre, perhaps even sad. It may be an unusual choice, considering that puzzle games are traditionally upbeat and exuberant, but nevertheless it gives depth and believability to the world that you are trying to escape from. In theory, you would expect the puzzles in Test Chamber to be fairly trivial. After all, the chambers are only around ten blocks square, and how devious could the designers be in that small space? Well the answer is, very devious indeed. There’s a good chance that you’ll find yourself staring at some of the chambers, saying out loud that it can’t be done. But then, a few minutes later, or perhaps a few hours later, the penny drops as you find the embarrassingly simple solution. Shark Jump actually list “face-palm moments" as one of the game’s features, and that is very true. Several times I completed a level, laughing at myself that it had taken so long. This is great puzzle design. Test Chamber can easily withstand lazy comparisons to other physics-bending games such as Monument Valley ($3.99) and Fez. Rather than coming across as any sort of wannabe or cheap knock-off, Test Chamber quickly stamps its mark as something original and unique. I wouldn’t be surprised if another game studio, perhaps one with deeper pockets, takes the core idea of Test Chamber and runs with it. And sure they may produce something more spectacular with better graphics and shooty things and stuff that goes bang, but we’ll all remember that Test Chamber did it first, won’t we? The free version of the game includes 28 levels, with a $2.99 in-app purchase to unlock more levels and get you access to any future updates. The main menu teases you with an under-construction section for random levels and a level editor, but there’s no timeframe given for these features arriving. There isn’t much to fault with Test Chamber. Playing on an iPad Mini 2 and an iPhone 6 Plus, the game feels slightly sluggish. It’s not a fast-paced game by any means, but there’s noticeable choppiness when pushing objects around. My only real complaint is that the game forces you to turn your device to the right, which causes the iPhone/iPad speaker to be muffled by your left hand. If you prefer to turn your device to the left and keep that speaker uncovered, then being forced to hold it the other way could get on your nerves a bit. 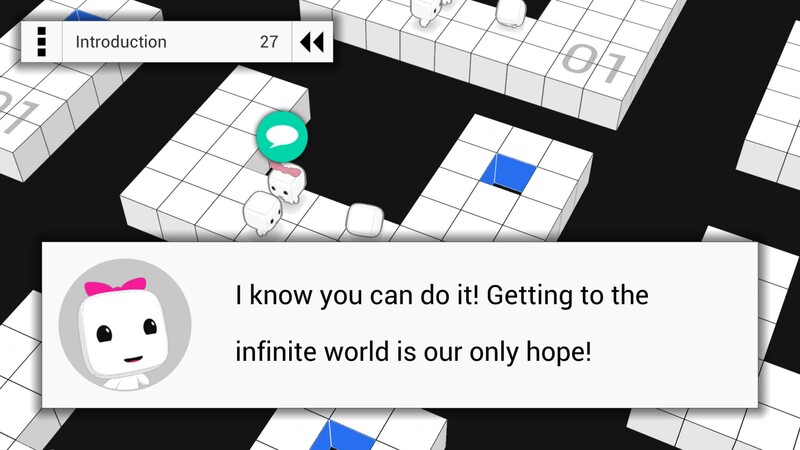 Test Chamber is a superbly-conceived and well-crafted puzzle game that will exercise your brain in the most satisfying way. You shouldn’t play it just because it deserves to succeed, it should succeed because it deserves to be played. My only concern is that, currently, the sole reason to pay for the premium version is to get more levels, but a lot of people (myself included) may find the free levels so taxing that they will never reach the point of needing to pay for more. So even if Shark Jump end up with a hit on their hands in terms of downloads, reviews and word-of-mouth recommendations, the difficulty level of their game may hinder it from being a financial success, and that would be a shame.